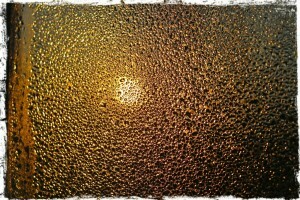 The days are noticeably shorter and colder all of a sudden! The sun sets earlier now, and by the time I get home from work, it’s already getting dark. I have a wonderful commute home through lots of cornfields and down a hill with a great view of the setting sun. 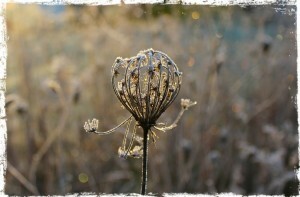 The colors of the sunset are so soothing, featuring orange-rose toward the ground gradating into a soft blue higher up. There’s also purple in the mix. I love seeing the bare trees silhouetted in front of the rich, gradated colors. At this time of year, I am in search of light – savoring the sunrise and appreciating the way the rising sun interplays with water in its various states. Frost crystals coating leaves and plants become prisms reflecting the sunlight in a variety of colors, glowing like lights on a Christmas tree. It thrills me to see the world fill with light each morning and to see the light shine through leaves and other natural objects, making them come alive with vibrance. Drawn intensely to light as the sun travels a path lower in the sky, this is also the time of year when I become motivated to make lanterns to illuminate the darkness. 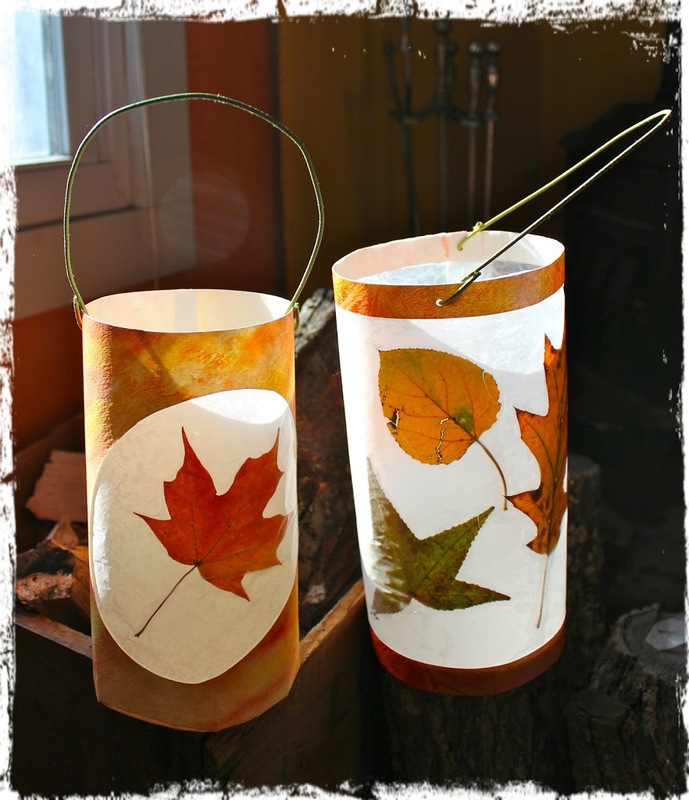 This week, I made two different kinds of leaf lanterns. 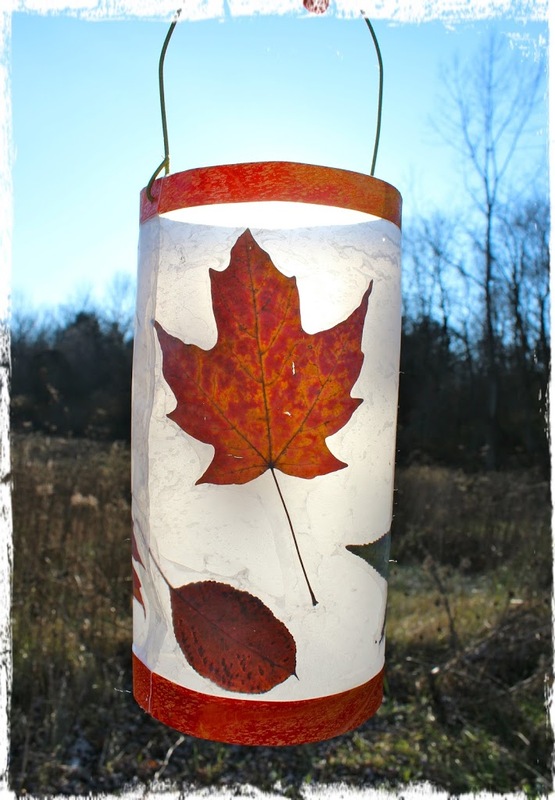 The first is a transparent, wax paper lantern that I have adapted over the years from a wonderful, Waldorf-inspired book called Earthways: Simple Environmental Activities for Young Children by Carol Petrash. Cut off the bottom 3/4” of the cylindrical container, and recycle the rest. This will be the base of the lantern. 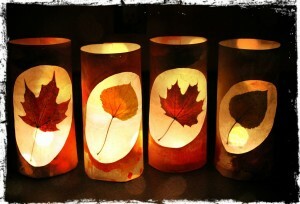 Cut out two 18.5″ wide by 9″ tall pieces of wax paper. Place one piece on top of an ironing board (or a pillowcase-covered table surface). Turn iron to lowest setting. 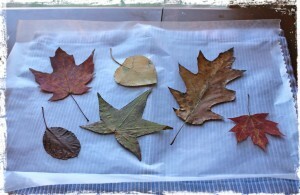 Arrange pressed leaves on the wax paper, with their most colorful side facing you. Cut a few 3/4”-wide strips from the cardstock. (I had on hand some pretty paper painted with acrylic inks that I used instead of cardstock.) Glue a strip along the entire bottom and top edges of the wax paper, making sure the strip is glued to the side that shows the leaves’ brightest colors. Although you can’t tell from the photo, my strips weren’t quite long enough, so I used pieces of another strip to extend them to the edge. Next, attach the wax paper to the base by lining up the bottom of the wax paper flush with the bottom of the base. (Make sure the side with the cardstock strips faces outward.) Carefully glue around the edges of the base, and roll the wax paper around it. (A hot glue gun makes this step easier, but you’ll have to work quickly.) You’ll end up with some overlap between the two wax paper edges, so run a thin line of glue from bottom to top at the overlap, to close the lantern into a cylindrical shape. Next, make two holes with a hole punch or a pencil point close to the top of the lantern. The holes should be opposite each other. Attach whatever type of handle you’re using through the two holes. If you’re using a paper shopping bag handle or wrapped wire, either twist or glue each end together to fasten securely. If you intend to light the lantern with a real flame, attach a votive candle holder or jar to the lantern base by using a small piece of double-sided tape, and put a tea light inside. 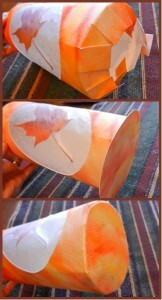 And now for the second kind of leaf lantern, which I made this week with my kindergartners. 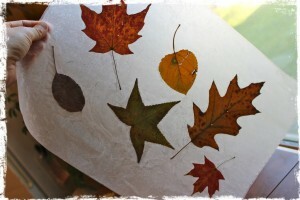 Earlier in the fall, I had my students do watercolor crayon-resist leaf rubbings. 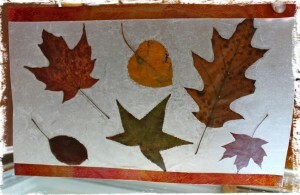 First, they rubbed the watercolor paper with crayons to reveal the texture of the leaves underneath the 9″x12″ paper. Then they covered the entire paper with fall-toned watercolors. The crayon markings resisted the watercolor and stood out. 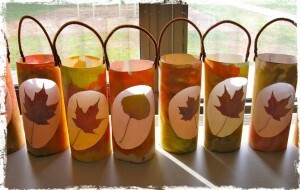 These masterpieces were displayed in the hallway for a while until we converted them into leaf lanterns. In other words, we repurposed their art work! Iron a pressed leaf between two pieces of wax paper on the lowest heat setting. Then trim the fused-together wax paper so there is some space around the leaf. In the center of the painted paper on the back side, trace around the wax paper piece. 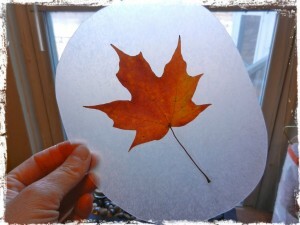 Using a razor paper trimmer, make a cutout inside of the traced shape, leaving at least 1/4″ all the way around. (In other words, the opening in the lantern needs to be somewhat smaller than the wax paper shape. 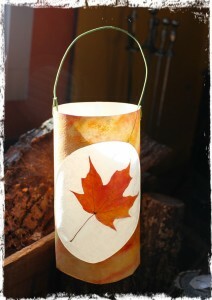 Save the painted paper cutout; it will be the bottom of the lantern. 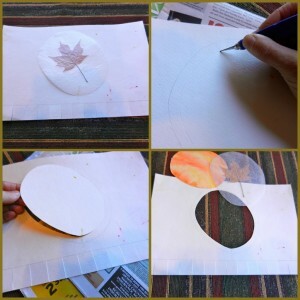 Put a line of glue around the edges of the cutout (still on the back side), and adhere the wax paper leaf so the duller side of the leaf is facing you. Since hot glue dries very quickly, you’ll need to do the gluing in quick, small segments. Fold the fringes inward toward the center so they almost form a base (with some space at the center). Then cover them quickly with hot glue, and press the painted paper cutout on top (with the painted side facing you). Quickly turn it so the base is resting on your tabletop surface, and press down with your fingers to adhere the base to the fringes. Trim the base for a neat, finished look. 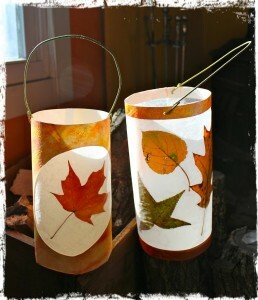 Next, make two holes with a hole punch or a pencil point close to the top of the lantern. The holes should be opposite each other. Attach whatever type of handle you’re using through the two holes. If you’re using a paper shopping bag handle or wrapped wire, either twist or glue each end together, to fasten securely. If you intend to light the lantern with a real flame, attach a votive candle holder or glass jar to the lantern base by using a small piece of double-sided tape, and fit a tea light inside. 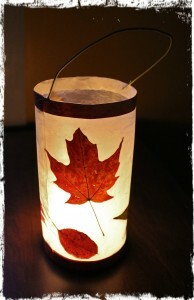 Be careful not to leave your lit lantern unattended, or use an LED tea light for no worries! The lanterns bring such beautiful light and ambiance to a room! Enjoy! © Susan Meyer and River Bliss, 2012-2013. Unauthorized use and/or duplication of this material, including all photos, without express and written permission from this blog’s author/owner is strictly prohibited. Excerpts and links may be used, provided that full and clear credit is given to Susan Meyer and River Bliss (www.riverblissed.blogspot.com) with appropriate and specific direction to the original content.